HADECS (Highways Agency Digital Enforcement Camera System) cameras are used to enforce variable speed limits under the Active Traffic Management (ATM) system on the M42 and M6 through the West Midlands. The ATM scheme automatically adjusts the speed limit on the motorway to keep traffic flowing during busy periods. The system comprises two camera systems and can enforce up to 4 lanes of traffic. 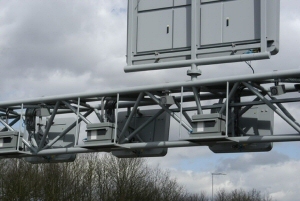 The cameras are mounted to gantries over the motorway and are linked to the ATM system to adjust their activation threshold when the speed limit changes, which will then apply a 60 second grace period where enforcement is disabled. The cameras are digital and do not require the use of wet film. A radar, in the camera, measures the speed of the vehicle as it travels along the road. If the vehicle's speed is above the threshold as determined by the current speed limit (eg. 60 mph) then the camera takes three pictures. These photographs are encrypted to the standards specified by the Home Office Scientific and Development Branch (HOSDB) and are frequently downloaded by the back-office system. The images are decrypted by the back-office system and analysed by enforcement staff. Two of the pictures provide a secondary check of the vehicle's speed as they show the position of the car in relation to the check marks on the road and allow enforcement staff to determine which vehicle is exceeding the speed limit. The third photograph provides a close-up view of the vehicle registration plate for identification purposes. These diagrams and explanations are designed to give a fair interpretation and overview of how different cameras work. They are not an exact technical representation of cameras and camera sites.